It was my turn to host No Croutons Required this month. As many of my readers will know, this is a monthly roundup of vegetarian and vegan soups and salads alternately hosted by my dear friend Jacqueline and myself. We had a nice turnout this month and so I have 15 mouthwatering dishes to present. As expected, the majority are salads. Settle in and have a look at the contributions this time around. A special thanks to everyone who took the time to submit a dish. Our first submission is this lovely tart, tangy and cheesy salad. 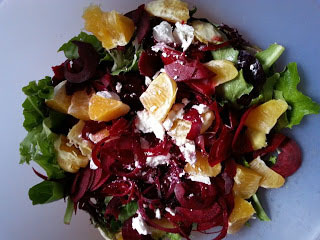 Mixed greens, navel orange, beets and creamy goat cheese are all dressed up with Greek yogurt, Dijon mustard, orange juice and white wine vinegar. Just perfect for the season. Asparagus and mushrooms do come together so well. 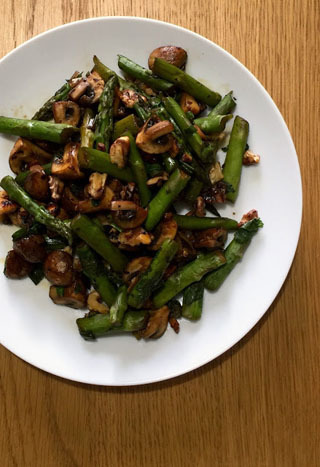 Inspired from a Chinese restaurant, this salad features asparagus, mushrooms, spring onion, walnuts, soy sauce, rice vinegar and fresh coriander. A wonderful mix of flavours. 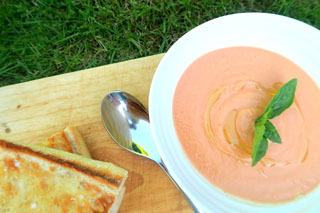 Another early summer recipe that is sure to stimulate the appetite. 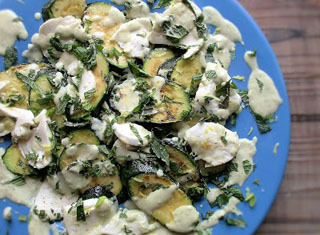 Here we have zucchini, mozzarella cheese, fresh mint, olive oil, fancied up with a zesty pesto. 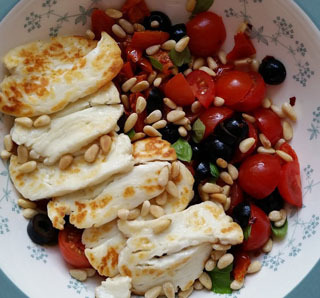 Yet another seasonal salad and we can never have enough ideas for salads in this heat, can we? 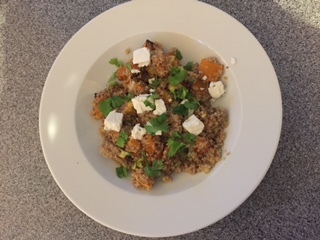 Risottos are quite popular in my kitchen, and this one features quinoa, roasted squash, spring onion, fresh herbs and this delicious dish is topped with feta. Certainly could be served as a cold salad. 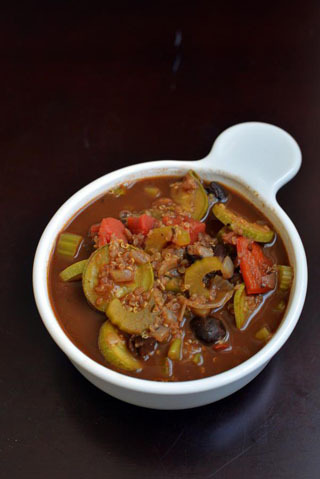 Next up is an intriguing version of vegan gumbo. Here zucchini is the star instead of okra and is combined with quinoa, onion, red pepper, celery, tomatoes, file powder, cajun seasoning, thyme, bay leaves, Ayocote Morado beans and Gordo. That is surely a complete and nourishing meal. A luxurious lunch or light dinner indeed, this gorgeous salad features golden fried halloumi, sun-dried tomatoes, cherry tomatoes, pine nuts, basil and some fresh lemon juice. Served up with some crusty bread, this surely would be one satisfying meal. 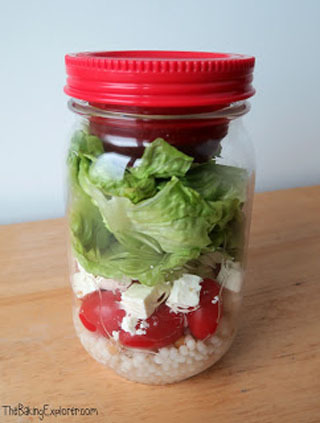 Next up is a roundup of mason jar salads. Kat's contribution is a lovely portable salad. The idea is to layer the ingredients, beginning with the dressing, vegetables and proteins in the middle, and salad greens on top. Shake before you are ready to eat. No mess, and little fuss. This sweet and tangy salad would be sure to stimulate my appetite. 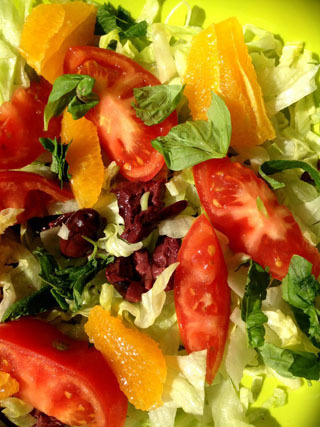 Although it might be considered a different combination of flavors with the olives throw in with the orange, tomato, lettuce, herbs, olive oil and lemon juice, I am sure this would be a wonderful salad and quite a refreshing one too. Here we have another ideal summer time meal. Soaked crusty bread is whizzed together with red onion, garlic, some cucumber, red pepper, tomatoes and sherry vinegar. Served up with toasted crostini, you need nothing else for a satisfying summer dinner. I could get excited about this salad too. Johanna tweaked the recipe and got it just right. 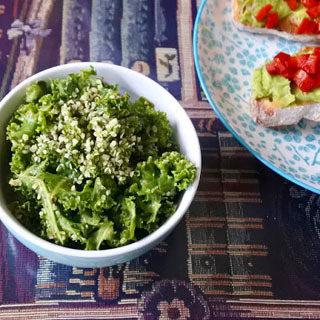 Kale is dressed up with nutritional yeast, tahini, lemon juice, tamari, maple syrup, flax meal, a few onion granules, some garlic powder and then garnished with some hemp seeds. I will certainly be trying this one. Homemade bread is especially nice with soup. 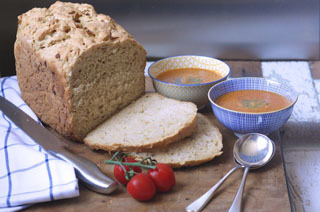 A caramelised onion rosemary bread is paired with a lovely soup made up of cherry tomatoes, oregano, basil, balsamic vinegar, stock and some pesto to serve. Just imagine dipping that bread into the soup. Just yum! This colourful salad is sure to please. Based on her Dad's recipe, this is a simple side that goes well with a number of dishes. 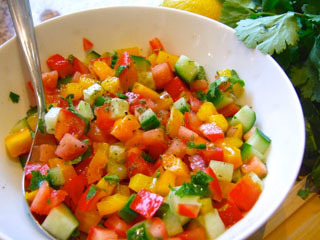 Tomatoes, cucumber and yellow peppers are all dressed up with parsley or cilantro, lemon juice, olive oil and a bit of zaatar. I love miso in soup and this one seems a special treat. 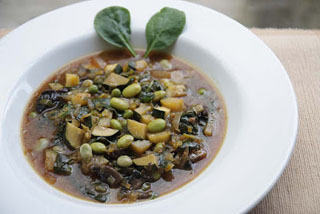 Onions, leeks, chestnut mushrooms, brown miso, courgette, frozen edamame, peas and broad beans and spinach are all simmered together. I would enjoy more than a spoonful of this soup no matter the time of year. This salad is substantial enough to serve as a main meal. 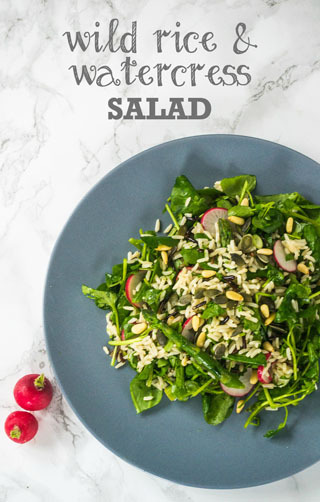 Wild rice, asparagus, radish, spring onion and watercress are tossed with parsley, lemon juice, french dressing, pine nuts and pumpkin seeds. Surely a nice patio dish. 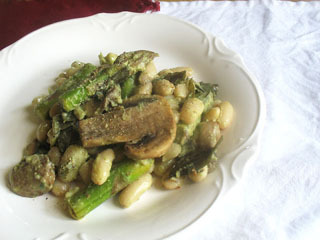 My submission this month is a seasonal salad that features local asparagus, cannellini beans, curry leaves and sauted white mushrooms. I dressed it with fresh tarragon, garlic, lemon juice and zest and some Dijon mustard. It's a snap to make up and satisfying. That concludes the May edition of No Croutons Required. Jacquline is hosting the June edition for 2016, so to be sure to check her blog for the announcement.